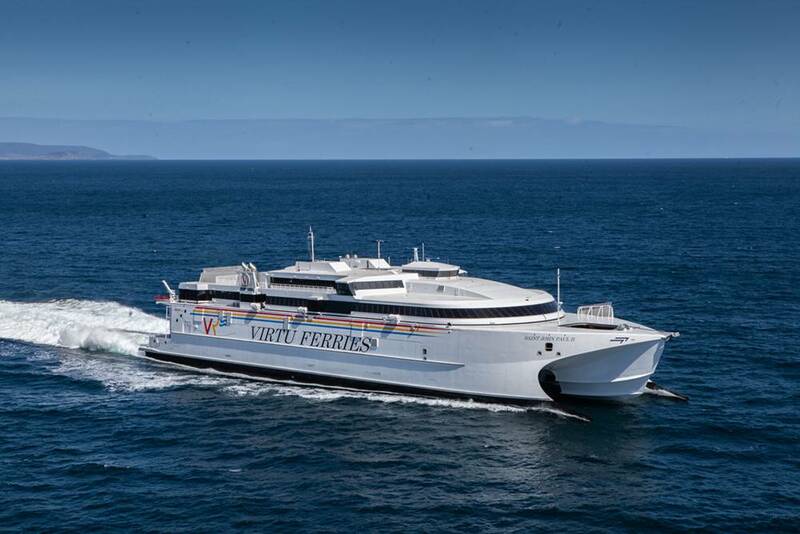 Incat delivered its latest large fast ferry, a 110-meter catamaran for Virtu Ferries of Malta dubbed Saint John Paul II. “Using the latest computational fluid dynamics (CFD) and hydrodynamic free-running model test techniques, the well proven Incat Wave Piercing Catamaran hullform has been further developed for Mediterranean winter conditions," said Tim Burnell, CEO, Incat. Marine Consulting at the Ocean Basin and Ship Tank in Gosport, UK – facilities normally associated with UK Ministry of Defence projects. “The result is a completely new bow arrangement and increased tunnel height, ensuring Saint John Paul II is truly fit for purpose on year-round ferry operations on what is an exposed Mediterranean island route,” said Burnell. “As an island nation with a strong and growing economy it is imperative that Virtu Ferries’ year-round lifeline passenger and freight services are reliable,” said Francis Portelli, Chairman and Owner, Virtu Ferries. “During the winter months we can experience very strong winds and high waves on our route. So we wanted a hull design developed to minimize fuel consumption and to increase passenger comfort and seakeeping performance, at the desired contract speed, in simulated sea conditions prevailing in the Malta Channel. This is in line with established green policies being recommended by the international maritime industry. Saint John Paul II was completed under DNV GL classification society rules and she complies with IMO HSC Code 2000 rules, Malta flag statutory requirements and Italian port state requirements. “For Virtu Ferries this new vessel provides a significant increase in capacity over their existing vessel operating on the Malta – Sicily route, offering 43% more truck capacity, 15% more passenger capacity and 7% more car capacity,” said Burnell. At 1,000 dwt, the vessel is the largest RoPax catamaran ever built for operation in the Mediterranean and is the second largest in the world. She has capacity for 900 passengers on two decks and additional outside seating on both upper and lower passenger levels. The full span of the vehicle deck is designed to carry 23 heavy commercial trailers, equivalent to 490 truck lane meters or 167 cars. Vehicles:490 truck lane meters at 3.5m wide and 4.6m clear height or up to 167 cars at 4.5m length x 2.4m wide. Water Jets: 4 x Wartsila LJX 1500SR waterjets configured for steering and reverse. Generators: 4 x 300ekW MTU 8V2000 M51A generators. Evacuation:4 x LifeRaft Systems Australia (LSA) Marine Evacuation Stations (MES). Two port, two starboard each MES capable of serving up to 300 persons. Eleven x 100 person lifefafts are fitted. 2 x SOLAS inflatable dinghies with 25hp motor & approved launch/recovery method.